In this study, changes in some non-specific immune defense mechanisms of rainbow trout (On-corhynchus mykiss) following exposure to aqueous extracts of Nigella sativa seeds were inves-tigated. A total of 900 fish (mean weight 102.3g) were used in the study. Fish were treated with black seed oil using one of three different application techniques. 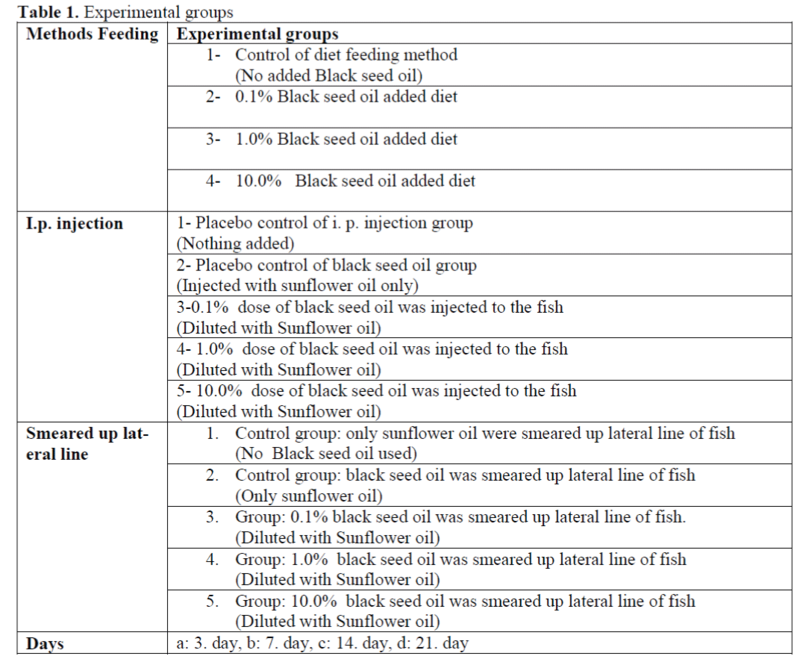 The first method involved feeding the fish with 0.1%, 1.0% and 10% dilution of black seed oil over a 21d period. In the second method, 0.1%, 1.0% and 10% dilution of black seed oil was injected to the fish. In the third method, 0.1%, 1.0% and 10% dilution of black seed oil were applied directly onto the lat-eral line of fish (‘smearing’) over a 3d period. Blood samples of fish were taken at 3, 7, 14 and 21d post-exposure and hematocrit, leucocrit, erythrocyte, leucocyte, nitroblue tetrazolium ac-tivity, protein level and total immunoglobulin levels were determined. The highest levels of hematocrit, erythrocyte, leucocyte and nitroblue tetrazolium activity occurred in fish exposed using the smearing method. Differences in leucocrit levels of groups exposed to the three methods were not significant. The highest levels of total protein occurred in fish exposed via feeding. The highest levels of total immunoglobulin occurred in fish exposed via injection and decreased suddenly. Nonetheless, the smearing method caused regular increase and decrease. It was observed that black seed oil caused increase of fish protein content, even at the lowest dose in fish exposed via feeding. In this study, the effects of smearing method were investi-gated on immune system of rainbow trout, as well as, determined differences of feeding and in-jection methods on immune response than smearing method. Black seed oil, Rainbow trout, Nigella sativa, Oncorhynchus mykiss, Non-specific immune parameters, Immune system of fish. The use of immunostimulants as an alternative to the drugs, chemicals and antibiotics currently being used to control fish diseases in fish culture has a limited success rate. After all, herbs have perfectly complex matters (tanens, terpenes, al-dehides, aromatic hydrocarbons, etc.). The com-plex has both immunostimulant and comple-mental materials necessary for body (Logambal et al., 2000; Yunxia et al., 2001). At present, the treatment of fish diseases and prophylaxis uses both traditional methods and di-etary supplementation, injection and bathing. The use of feeding methods to treat various fish ail-ments with antibiotics and chemical im-munostimulants is insufficient. The most com-mon method of all is the primary injection and secondary bath method. However these methods are costly in terms of manpower and may also cause increased stress to fish in comparison to basic feeding methods (Alberto et al., 2005). Immunostimulants in herbs contain com-pounds that are passed directly through fish skin. Having immunomodulatory materials in Black seed (Nigella sativa) is considered to be one of the greatest healing herbs. Black seed oil is thought to have both immunomodulatory and immunostimulant properties. Synthetic stimulants used in aquaculture are deposited in fish tissue and are potentially passed indirectly to human consumers. For this reason, organic, herbal prod-ucts may be prefered as fish immunostimulants (Al–Ghamdi, 2001; Badary et al., 1997; Badary and Gamal, 2001; Islam et al., 2004). A total of 900 rainbow trout (Oncorhynchus mykiss) of 102,30g mean initial body weight were obtained from the Çirçir Rainbow Trout Fish Farm (Keban/Elazig, Turkey). Fish were maintained in re-circulating tanks for adaptation for one week. The fish were then divided into four groups (one control and three experimental groups), each comprising 50 fishes, and exposed to one of three methods (diet, intra-peritoneal in-jection and smeared up at lineal lateral). Experi-mental groups were fed diet at a rate of 2% fish body weight per day for a period of three weeks. At the end of study period, fish were anaesthe-tized with Benzocaine (50 ppm) and blood was taken by caudal vein puncture with heparinized syringes. Hematocrit (Ht), Leucocrit (Lt), Eryth-rocyte, Leucocyte, Nitroblue Tetrazolium (NBT) activity, Protein level and Total immunoglobulin levels were determined. All data were analyzed using SPSS and Microsoft Excel. Experimental groups are detailed in Table 1. Leukocyte levels in the fish fed with 0.1%, 1.0% and 10.0% black seed oil added diet were found to be different compared to control group (P<0.05). Leukocyte levels in the fish with 10.0% black seed oil i. p. injection was found to be dif-ferent compared to control group (P<0.05) but another were not different. Leukocyte levels in the fish smeared up lateral line with 0.1%, 1.0% and 10.0% black seed oil were found to be differ-ent compared to control group and leucocyte lev-els of other groups (Table 2). Table 2. Leucocyte levels in Rainbow trout black seed oil were smeared up lateral line of fish (Diluted with Sunflower oil). Erythrocyte levels in the fish fed with 0.1%, 1.0% and 10.0% black seed oil added diet were not found to be different compared to control group (P>0.05). Erythrocyte levels in the fish with 10.0% black seed oil i. p. injection were found to be different when compared with the control group at the 14. day. Erythrocyte levels in the fish smeared up lateral line with 0.1%, 1.0% and 10.0 % black seed oil were found to be dif-ferent when compared with control group and leucocyte levels of other groups (Table 3). Table 3. Erythrocyte levels in Rainbow trout treated with black seed oil smeared up lateral line of fish (Diluted with Sunflower oil). Haematocrit and leucocrit levels in the fish fed, i. p. injection and smeared up lineal lateral with black seed oil weren’t found to be different compared to control group. NBT levels in fish fed with 0.1%, 1.0% and 10.0% black seed oil added diet were not found to be different when compared to the control group. But at the 14. day, these levels were in-creased. NBT levels in fish with 0.1% and 10.0% black seed oil i. p. injection were found to be dif-ferent compared to control group at the 14. Day (P>0.05) and later were decreased. The most NBT levels in the fish smeared up lateral line with 10.0% black seed oil were found to be dif-ferent when compared with the control group and NBT levels of other groups as long as 21 days (Table 4). Table 4. NBT levels in Rainbow trout treated with black seed oil smeared up lateral line of fish (Diluted with Sunflower oil). Total protein levels in fish fed with 0.1%, 1.0% and 10.0% black seed oil were found to be different when compared with the control group and total protein levels of other groups as long as 21 days (Table 5). Table 5. Total protein levels in Rainbow trout treated with black seed oil smeared up lateral line of fish. (Diluted with Sunflower oil). Total Ig levels in the fish i. p. injection with black seed oil was found to unstable increased compare to control group and Total Ig levels of other groups as long as 21 days. But, Total Ig levels of fish in the black seed oil smeared up lat-eral line of fish was showed a parabolic line. (Table 6, 7). Table 6. Total Ig levels in rainbow trout black treated with black seed oil injected into the peritoneal cavity of the fish (i. p.). (Diluted with Sunflower oil). Table 7. Total Ig levels in Rainbow trout treated with black seed oil smeared up lateral line of fish (Diluted with Sunflower oil). In this study, three different immunostimulant practice methods are used. Smeared up to linea lateral of fish that showed stimulated specific de-fense mechanisms of rainbow trout. Smearing black seed oil up the lateral line of individual fish proved to be the most efficacious method of all of those tested (also including dietary supplementa-tion and i. p. injection). The highest levels of Erythrocyte, Haematocrit, Leucocyte, NBT were all recorded in fish exposed to the smeared meth-od. Having powerful structure of immune system cells are not permitted to diseased by means of pathogen microorganisms. Diseases are blocked with higher NBT and Total Ig levels than normal levels in fish (Blazer and Wolke, 1984). 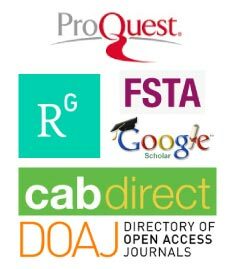 Intra-peritoneal injection is the most com-monly used method for boosting total Ig levels in the administration of commercial fish vaccines because of its reliability and high efficiency, and the results of our study support this (Sisson et al., 1997). But this method did not show parabolic equation. However, Total Ig levels of smeared method did show a parabolic equation, which is the desired situation for immunostimulatory methods because it indicates that immunostimu-lants accumulate over a long time in the tissue of fish. Especially, the highest NBT and erythrocyte levels were recorded in smeared method that is showed transdermal affects some of im-munostimulants as nigellin, nigellon and thymo-quinone. The organs of hemapoietic and immune system are stimulated by these immunostimulants with transdermal pathway. Serum protein level is an important indicator of humoral defense system of fish and increase especially in the fish fed with black seed oil. It could be concluded that black seed oil could be recommended as an immunostimulant sub-stance. It is also recommend using black seed oil by smearing up lineal lateral of fish for prophy-laxis rather than for treatment. Badary, O.A., Gamal, A.M., (2001). Inhibitory effects of thymoquinone against 20–methylcholantherene induced fibrosarcoma tumorigenesis, Cancer Detection and Pre-vention Journal, 25: 362-368. Yunxia, Q., Jianzhong, S. and Guoliang, W., (2001). A review of principal bacterial dis-eases of mariculture fish, Transactions Oceanology Limnology, 2: 78-87.